Partner with a local running store to establish a training program for your event, no matter the distance or the level. “People need a gathering place,” said Heather, and the local running retailer is a natural fit. This partnership is a win/win, as the store will welcome additional store traffic and potential new customers. Consider establishing a “non-traditional” event, or at least marketing to non-traditional event participants. There was quite a bit of talk around the growing popularity of mud runs and the like, and how these events are drawing in a whole new population. “I also see all the new types of races as strong sign of interest,” Bill wrote in an email. “People want to work out and become fit.” And they want to do it with their friends. Include a team competition in your event. You don’t necessarily need to reward the fastest time; you can reward the team with the most members, or the one that raised the most funds for your beneficiary, or even the one with the most creative name. 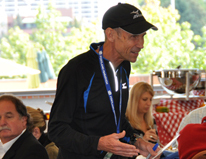 Bill Rodgers is a former marathon record holder and winner of both the Boston and New York City Marathons. Amby Burfoot won the Boston Marathon in 1968 while still a student at Wesleyan University and is currently blogger and editor of Runner’s World. Jeff Galloway was a member of the 1972 US Olympic team in the 10K and is currently CEO of Galloway Productions and monthly Runner’s World columnist. Heather Romano is editor of NW Runner Magazine. Rich Benyo is former Executive Editor of Runner’s World, and currently Editor of Marathon and Beyond and director of Napa Valley Marathon.